A Neal Porter Book, Roaring Brook Press, New York, 2015. 32 pages. When I first read this book, I gave it a glance through, and wasn’t tremendously impressed. I automatically cringe from anthropomorphic trucks, so I missed it’s charm. 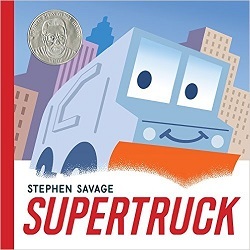 Then Supertruck won a Geisel Honor. Then I was scheduled to do a Mother Goose Story Time (for ages 0 to 24 months) the day before a blizzard was expected. I checked Supertruck, and it was absolutely perfect. The text is simple, with only a sentence or so on each page. This is perfect for reading to very little ones, and also perfect for kids just learning to read. Yes, the trucks are a little bit anthropomorphic, but it’s very simply done. Stephen Savage’s typical graphic design look adds a simple and friendly face to each truck. I love the way the garbage truck wears glasses. The story is simple. We meet three colorful, important trucks: a bucket truck, a fire truck, and a tow truck. They do important things, while the garbage truck just collects the trash. Then it starts snowing, and the city is caught in a terrible blizzard. Just then, the garbage truck sneaks into a garage and becomes . . . The glasses have disappeared, and he now sports a plow blade in front. He digs out the city, makes a path for the other trucks, and saves the day. The next morning, the trucks wonder about the mighty truck who saved them. Where could he be? He’s just collecting the trash. The final picture has snow falling again, and Supertruck heading into a garage with a sly smile on its face. Kids will love being in on the secret. Grown-ups will love the deft play on superhero tropes. This book is brilliant. Wonderful reading during a storm, but I predict it will still get turned to when the weather is hot. For any kid who loves trucks, as well as any kid who dreams of secret super powers. Or any kid who enjoys a well-told, simple story. This entry was posted on Saturday, September 10th, 2016 at 2:08 pm and is filed under Award Winners, Delightfully Silly, Easy Readers, Good for the Very Young, Picture Book Review, Starred Review. You can follow any responses to this entry through the RSS 2.0 feed. You can leave a response, or trackback from your own site.